News of this new “Shoppers Guide to Pesticides” came to me via Mother Jones this morning. It’s worth a look. It ranks 47 different types of fruit and veggies by the amount of pesticide residue contain. We should all care because eating a bunch a pesticides along with your daily portion of produce is known to effect your nervous and hormone systems. Pesticides are toxins with carcinogenic qualities. Coming in contact with them can also irritate your eyes, skin and lungs, according to the report, which cites a slew of scientific studies. It also offers tips on how to minimize your exposure but they are pretty limited; The authors suggest go organic. They also put in a plug for pressing lawmakers to demand full-disclosure of pesticides used in growing the food we innocently purchase in the supermarkets. And, once we knew, demand those toxins are limited or eliminated altogether. Good information but pretty lame advice which has been doled out on this subject for some years now with little movement toward full disclosure by the agribusiness giants in this country and abroad that produce so much of our food supply. Luckily, farmers’ market season is approaching. I am, however, sometimes worried that the small farmers who sell at our neighborhood market in Takoma Park might be using the same old pesticides and simply coasting on their “family farm” looks. What guarantee do we have that farmers market sellers are adhering to better practices and using fewer chemical inputs? Just because I question the lavish modus operandi of some of the world’s largest conservation groups and call them out for helping polluting corporations greenwash their image that hardly makes me a member of the deniers’ club. 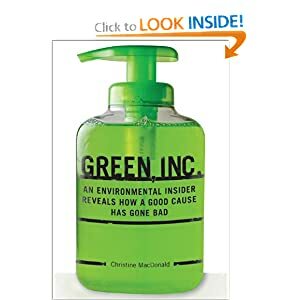 Finding passages from my book quoted on Internet sites devoted to attacking Al Gore and deriding efforts to address climate change is more than a little dismaying. As a writer, of course, it’s always nice to known people are reading your book. But these bloggers willfully misrepresent my findings. Far from suggesting we don’t have environmental problems, my conclusion, among other things, is that we need our environmental groups today more than ever. If groups such as The Nature Conservancy, World Wildlife Fund and Conservation International continue acting like enablers to the world’s largest polluters – industries such as oil & gas, mining and agribusiness – they risk losing all credibility. It’s particularly peeving to be used by a bunch of climate deniers at a time when environmentalists are losing the PR battle over global warming. A new Harris Interactive poll, reports that Americans increasingly have doubts about global warming, despite mounting evidence – not only that climate change exists – but that our chances are slipping away to head off the worst of it. According to Harris, only 51 percent of Americans agree climate change is real today, compared to 71 percent in 2007, and 75 percent in 2001. Why do you think people are growing skeptical about climate change? Somehow, I don’t think it’s the Al Gore-hating sites that have the biggest impact on public views.